This handsome chapel was built in 1809-10 at a cost of £1,912, and opened on the 8th July 1810. This chapel replaced a little chapel "situated in the back-yard in Clay-pit Street". In 1851 the chapel (in the photograph) had seating for 490 worshippers. On Census Sunday 30 March 1851 there were 250 worshippers at their morning service and 300 at their evening one. In addition they had 129 Sunday scholars. It was described then as "neatly pewed and fitted up with galleries". It was replaced by a new, gothic chapel erected in St.John's Street in 1879. 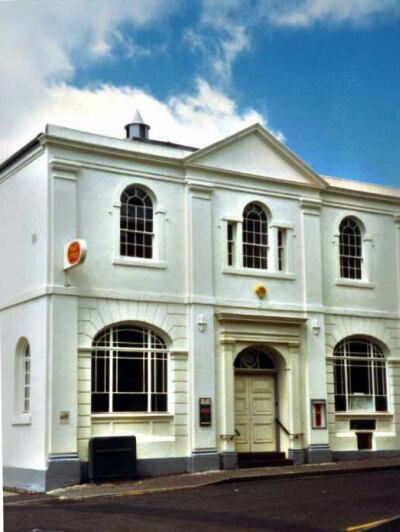 The original building was used as Whitchurch's main post office for a while, but by 2002 was used for the Whitchurch Heritage Centre which it still is in 2018.